A group of our scouts took part in Humberside Police Lifestyle project during the summer. Lifestyle is a project that was set up in 1989 to challenge young people to get involved with their communities, using their spare time to make a real difference, inspiring them to make positive choices and want to help others. 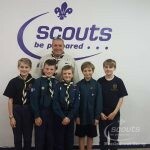 Well done to Edward, Fred, Jacob, Sam and Tom who donated the £75 they raised to Hessle Scout Group.